Being a child I grew up with mostly classical and Psychedelic Rock, so I have a good musical basics. Later on I discovered synthesizer music from groups like : Klaus Schulze and Tangerine Dream. Nowadays the foundation for Electronic Dance Music and is quite diverse. The same goes for my musical experiments. I started making music in 1985, the first time someone put a guitar in my hands, I played live and also spontaneous became the singer of the band. From this first experience I still have the recordings. Now I was hooked on making music. We started studio �Akkabar�, a simple studio setup with a lot of effects, electronic & band echo�s. We made some weird soundscapes and ambient style. Two years later, I started working with Atari and Amiga computers. So in 1987 I stared to work in the CEM (Centre Electronic Music) in Arnhem (NL), with my own projects and also followed some courses there : Trans (experimental mathematic music composer program) and programming in Pascal, a project to make my own sequencer software. I also did some courses in analogue studio technics. I worked with analogue synthesizers like : the ARP, MOOG & KORG. I helped to patch and rewire the whole studio, with multi cables and patch bays. In 1991, I started my project �Deep Trance Medium�, based on my Atari computer setup, with a lot of editors and Cubase. I had some digital synths and my first sampler : Akai S2000 and my first analogue synth : The Braintec, a double 303 clone with midi. I had a few live performances, but in these days, I didn�t had the money to buy light and small equipment, so every time I had to take my studio equipment with me, a large car full of stuff. After more than 10 years worked with this setup, the Atari became to old and slow (and out of spare parts), and I wanted more up-to-date synths like �virtual analogue� and real analogue synthesizers with midi. So in 2005 I started to rebuild my Atari into a PC studio, I had to find new editors and software and convert all movie files and arrangements to PC format. That was an enormous job and it took a lot of time. 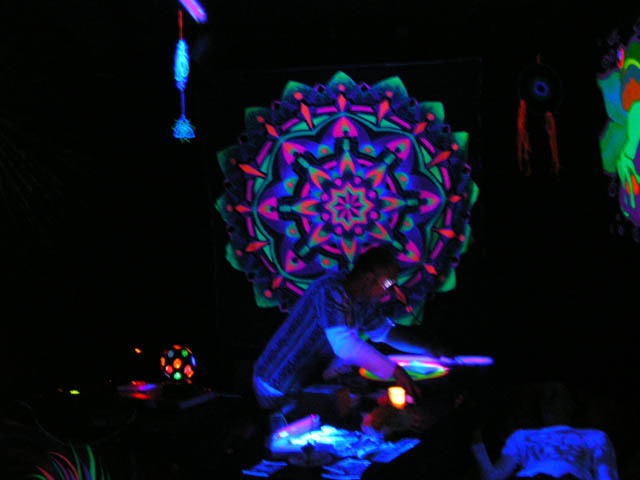 That time I worked in the �Willemeen� (pop centre for young people) and starting with performance as a Psychedelic DJ (Psybient, Psytrance & Forrest). It took to much of my time, there was no time left for my studio. In 2011 I restarted my studio project and now I had earned some money, that I spend very efficiently by buying all my equipment second hand or cheap. It took now 6 years to sell all my old stuff and buying new.